This is an original painting on grey glass panel. 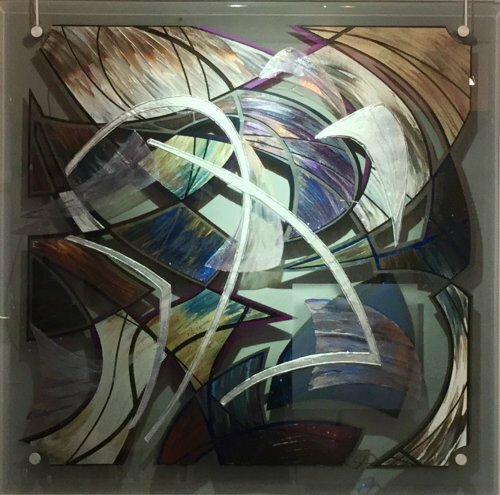 This glass panel is bevelled around the edge and has a shaped grey mirrored piece applied to the face of it, slightly proud from the surface, adding a three dimensional quality to the work. The glass is fitted with 4 metal stand off fittings allowing 1" gap between the wall and the painting. There will be no strings used, which are visible on this photo. The paints are multi layered and is painted on both sides of glass, which creates a complex and interesting design. Size is 80 x 80 cm.